Everyone loves online shopping, it’s the easiest way to order everything you need (and don’t need) from the comfort of your couch. But it was only a matter of time until cyber criminals turned the wonderful Amazon order receipt into a scam. Another day, another scam warning from your friends at PC Pitstop. Today we’re taking a look at a scam based around everyone’s favorite activity: online shopping. 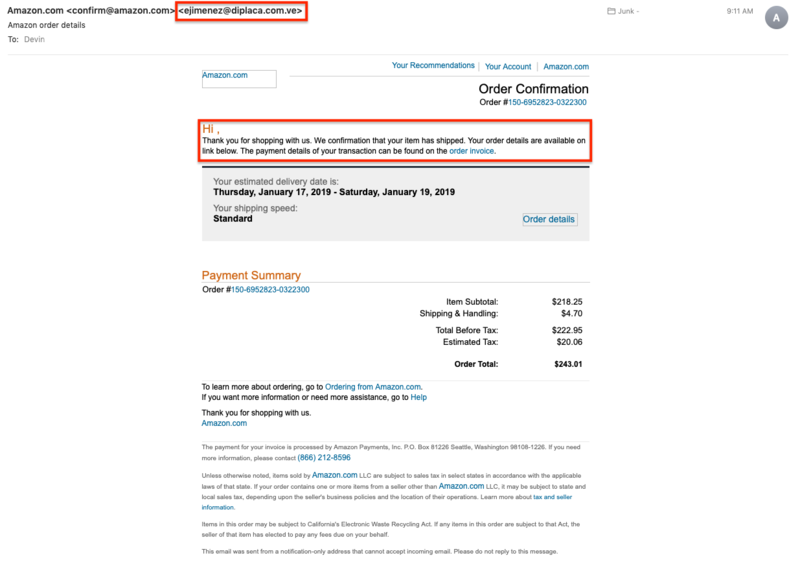 Normally when you complete a purchase online, especially at Amazon, the order confirmation email hits your inbox before you can close your web browser. This morning I woke up to one of those order emails in my spam folder. The first feeling is a little bit of excitement, maybe I forgot shopping a little too late last night and bought something I’ve always wanted. But alas, it was another sad attempt by your unfriendly neighborhood cybercriminals to scam me out of something. They’ll take the things you love the most and leverage them against you in the scam to hopefully get you to see past the flaws that jump out with a little careful investigating. We’ll start with the first thing I saw and what most others would see as well, the small window of details before you expand the message. Now right away this message doesn’t raise too many red flags for me except that it went to my junk folder. I get Amazon order emails all the time and they never end up in junk, so we’ll count that as +3 points on our scam scale (The scam scale goes up to 10, and I just made it up right now). Now with a score of 3, we’re not looking at anything that’s obviously a scam, but it should be enough to raise suspicion and look a little deeper than usual. Beyond being in the junk folder, the only thing that jumped out at me was a small typo that could be written off to my email client formatting. After the order number, the email begins with “Hi , Thank you f…”. Notice the spacing on either side of the comma, typically there wouldn’t be a space before a comma. Now that we are already at a 3/10 on the world-renowned scam scale, it’s time to dig into the details. Right at the start of the email, we get a look into the biggest clue for scam emails; who was this actually sent from. When expanded out it can no longer hide under a false amazon.com name so we’re able to see this was sent to us from a strange email address that Amazon would never use. In reality, this is a +10 on the scam scale. Once you see a strange email that pretends to be something else, we have verified this is a scam. But for the sake of the scam, we’re going to look further. Looking at the main content at the top of the message, the typos begin to shine through and add to our scam scale total. First, we can again see the double space around the comma after “Hi”. This is a small flag because in almost all cases Amazon isn’t making typos in their order emails. But we can then pair this with the typo in sentence three: “Your order details are available on link below.” Our order details are on link? Amazon certainly wouldn’t have that in their official emails (+2 to the scam scale). One place we’re always checking in emails or messages we think are scams: links. Hyperlinks can tell you a lot without actually having to click on them and visit the link. This is where our next tip comes into play; hover over everything. Hovering your mouse cursor over a blue hyperlink will give you the actual link behind the words. This email’s intent is to get us to visit either the order invoice link, or the order details link to go and see what we “ordered”. The rest of the links in the email actually point to valid Amazon sources to try and legitimize the message. However, once we start to hover around and check out what’s behind order invoice and order details, we can see it’s trying to link us to a completely different website then it should be. With these strange domains in the email, we should probably add more points to the scam scale. We’ll go with +5. After a complete dissection of this email, it’s obviously a poor scam attempt that left our scam scale maxed out at 20/10. The key here is to always be vigilant when it comes to emails and general online activity. If something seems to good to be true, it probably is. If you notice small typos in an email, especially from a corporation, look a little further. Even if after a small typo or small item raised your suspicion you’re still not seeing the other factors to bring your scam scale up to 10, just go straight to the source. In this case, I could quickly open my browser and go to www.amazon.com, log into my account and review my orders to ensure this order is indeed an imposter. Have you caught other types of scam attempts recently? Let us know in the comments! I cancelled my Amazon account..tired of the bogus confirmed orders being sent to me. Called them and told them I no longer use that account and the credit card is invalid..cancelled too. I get so many of these scam Amazon emails that I immediately report it as a phishing scam (I use Microsoft’s Outlook — formerly Hotmail — email server) as soon as I see that the return email address isn’t actually from Amazon. I don’t even have an account with Amazon and have never shopped on the site. Nor do I have an Apple account, yet I get even more scam emails purporting to be from Apple. That’s a good way to know right away that its a scam, keep up the good work Skeeter! Interesting, although I may have a better one. Your order is ready to be shipped? Amazon? not sure there is a company name as I delete it. wonder what would happen if I opened it? “We CONFIRMATION that your item has shipped”? Just what kind of grammar are these people using? That one, all by itself, is enough to make me back off VERY quickly! A major problem today is that too many people never learned proper English spelling and grammar in school, and that lack of knowledge probably leads to a lot of the successful online scams being perpetrated. If you don’t pay attention to what is written on the page, you are leaving yourself wide open to being fleeced. @Robert Bruce: That “We CONFIRMATION” jumped out at me too. I see quite a few scam emails with grammer like that. That’s one I didn’t even spot right away! Sometimes your brain just fills the gaps for you which can be counter-intuitive for finding scams. I’m still happy using my flip phone, but recently I’ve been getting a text from people I know saying they have a link for me. I was suspicious and called the person to find out that they indeed did not send me any messages. I have since been getting more of these scam messages. I began to reply FOAD! ALways a good move to take a moment and double check with them, nice work! Is there any way to ‘hover’ on a small mobile device (i.e., cell phone)? On some mobile devices like iPhones, you can touch the link and hold your finger on it for a few seconds. After that a small window will pop up asking if you want to copy it or open it and will show you the actual link behind the words similar to hovering! So far I haven’t fallen in the trap…..knock on wood! Glad to hear you noticed the scams before it was too late! I used to get fake Amazon emails years ago. They gave themselves away by being “from” the wrong Amazon (.com instead of .co.uk). I have since ordered one or two items from the US Amazon, but the UK one is still the primary one for me. I’ve received numerous emails form Banks, Credit Card Companies, and Amazon just as you mentioned. 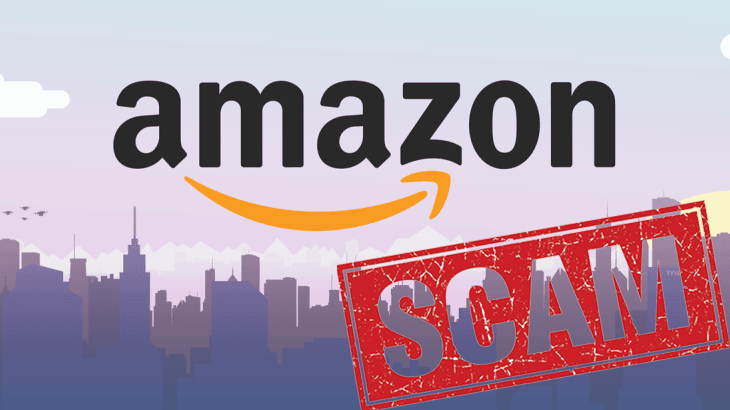 The only legit banks I have accounts with are very diligent in trying to stop these crooks, but apparently Amazon isn’t worried about their customers being scammed. The other thing I’ve noticed, the tense of English words used in the sentences of the emails. Whoever is sending these phony emails is not proficient in the English language. For instance, using “confirmation” instead of “confirmed” in your above example. So, when in doubt, call the 800#s for the “legit” company and double check everything you get online asking for linkage to your PC or wanting access to your personal information! I’ve been getting E-mails from various banks telling me my account has a problem. Unfortunately for the scammers I don’t have accounts at those banks. I did notice, like you mention in the article, that the e-mail weren’t sent from the banks. Somehow, a spammer has hijacked Amazon emails to me related to a charitable organization for getting Amazon donations. Whenever, I get an advertising email (legitimate) from Amazon, I get a message saying that my choice of donation is no longer available. Amazon tells me the donation is still available and that the message was from an unauthorized source. Amazon has been of no use in eliminating this problem.